Hello my dear Doodlebug friends, how are you today? As for me, I'm super excited to share the projects I've made using Hats Off collection. I have these pics since I graduated from college, 15 years ago (I'm old!!!) 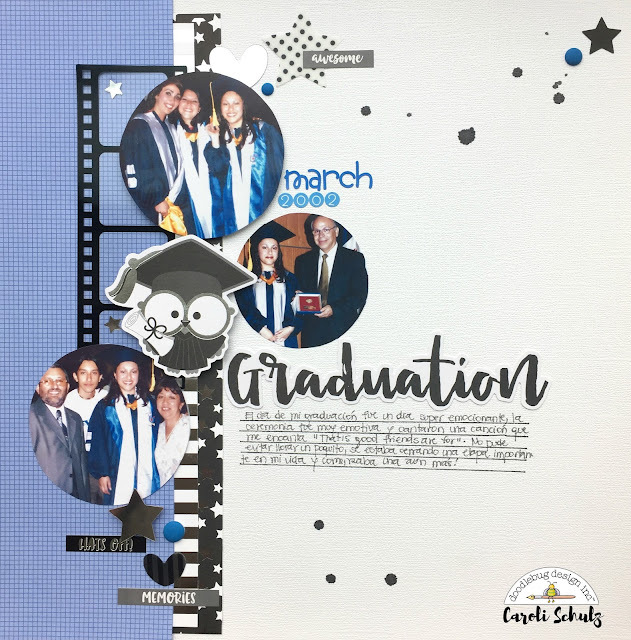 and never scrapped them because never found the appropriate collection to do it so.... until Doodlebug geniouses came up with this and I knew the moment to undust my old grad pics. I dont have too many pics and most of them wew taken with an analog camera, (yes, I AM THAT OLD! LOL!) so I scanned my pics and printed in a more convenient size to use them on my pages. I love the shades of black, white and silver of this collection, it's really beautiful and very adult at the same time. I combined it with some blue basics to match the colors of my Alma Mater. 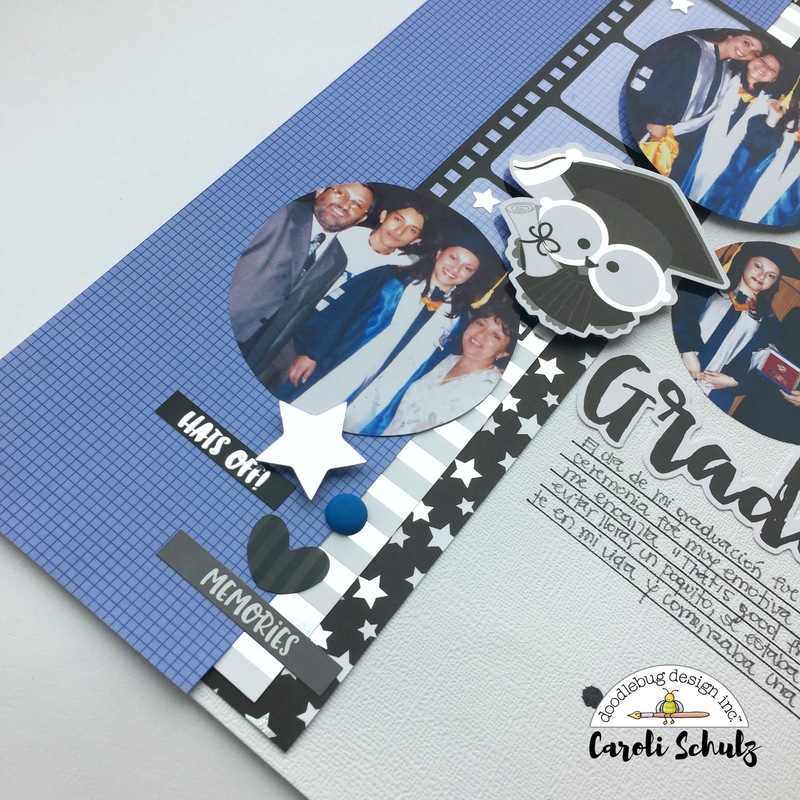 In my first layout I used some layers and round pics, I love the cute graduated owls included on the Odds & Ends package. 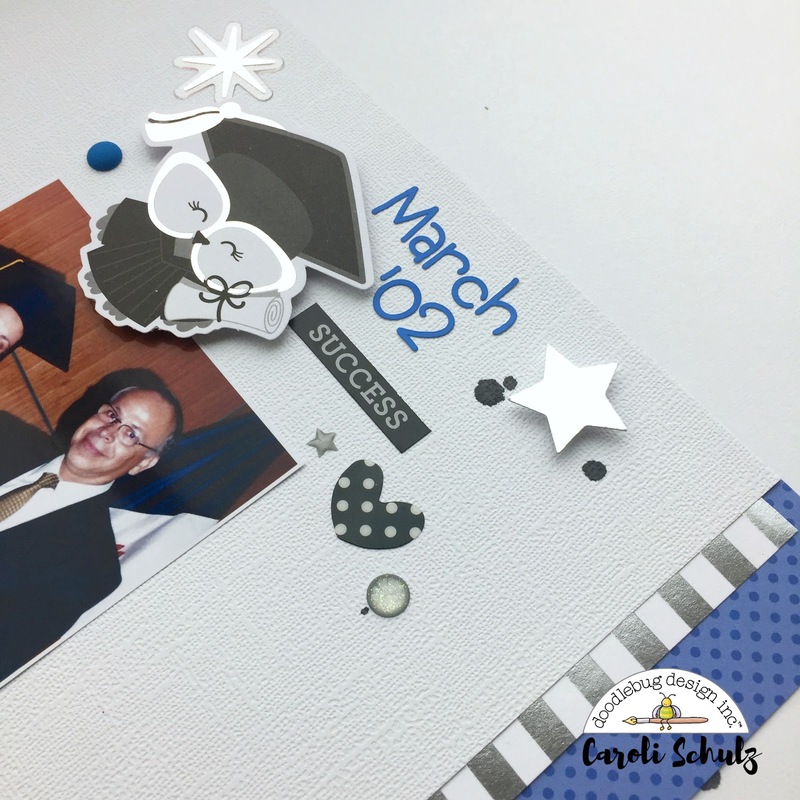 I also love the clear acetate elements included, I used some here and there as well. Don't you just love all the silver in this collection? In general I love metallic details on paper and embellies and this collection really rocked that. For my second layout I usedmy fave grad pic, I look so serious and formal receiving my award, so proud as well. I created some kind of embellishments cascade and used a lot of elements from the odds & Ends package, sprinkles, and also some ink splatters. 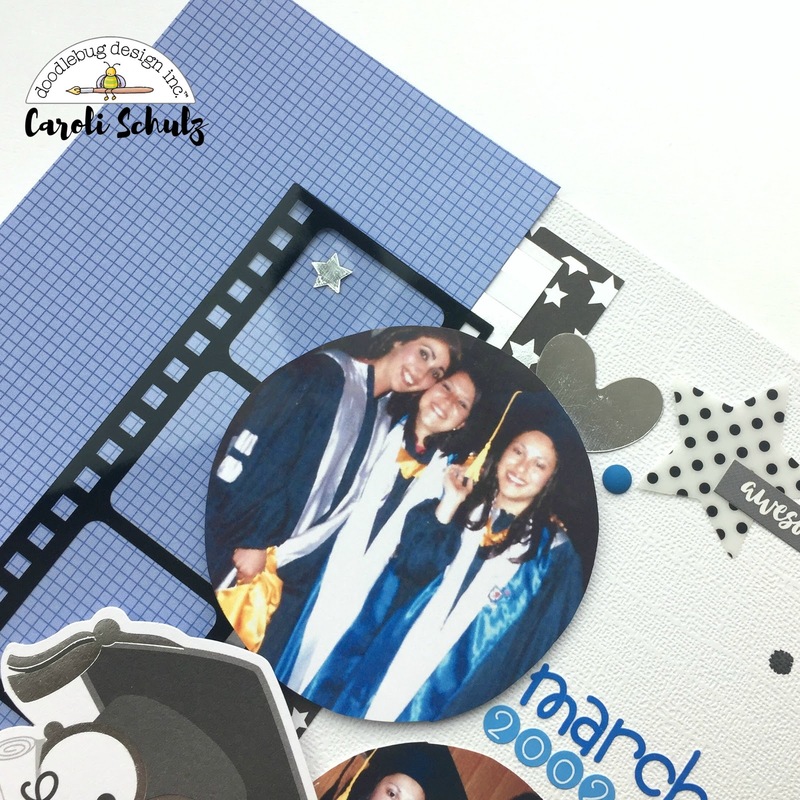 Again, the little graduated owl was my chosen embellie, how cute is that! I created my title using a phrase from the Odds& Ends package and letter from the blue Teempsy Type Alpha. 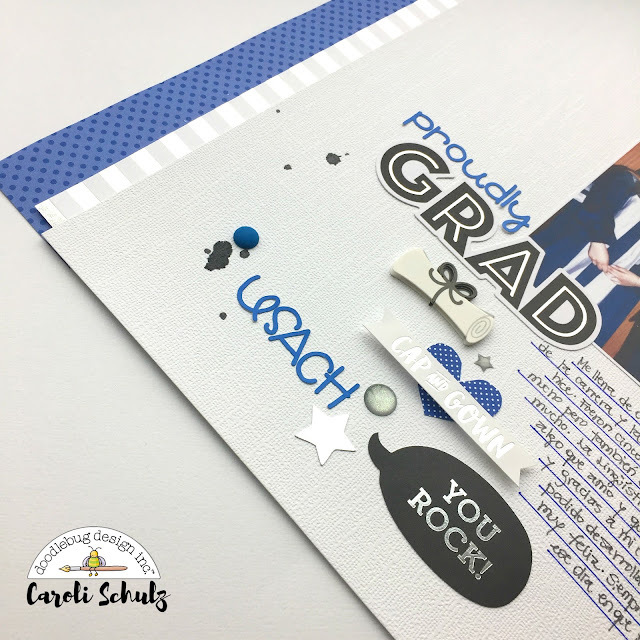 I really had a lot of fun working in these layouts, this collection is really different from regular Doodlebug Design items and I LOVED it! Also i had a good laugh with my little girl showing her my graduated pics, she just thought I looked ridiculously funny in my cap and gown, LOL! 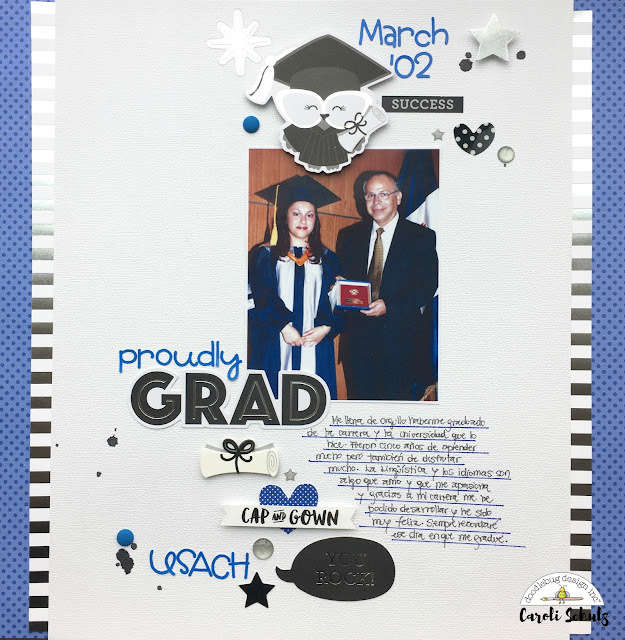 I hope you got some imspiration from my layouts and decide to scrap your graduartion pics as well, it's a beautiful excersise to remember good old days, isn't it?